Please Click Here to visit the Arrow Tech Associates Website to learn more about us. Projectiles are quickly created using the PRODAS model editor. 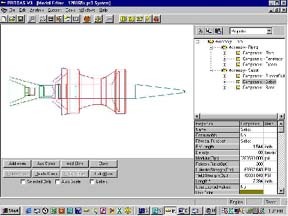 Designed and optimized for projectiles, it is much quicker and easier to use than a standard CAD package. Drag and drop projectile assemblies or components from one projectile to another. DXF & IGES File Write! PRODAS V3 can create IGES (V 4.0) & DXF Files for easy output to CAD Systems. Simple Elements are combined to describe the geometry of Components. Material properties are defined at the component level. A Material Reference Book is included to ease this process. Components are combined to make up Assemblies. Assemblies can be combined to form higher level assemblies.